Medicaid expansion has been a rallying cry for both the politically far left and the politically far right. This post will examine some of the healthcare differences between those states that participated in Medicaid expansion and those states that did not expand Medicare. Life expectancy. Based on data from the CDC, people living in states that adopted Medicaid expansion live an average of 1 year longer than those living in states that did not adopt Medicaid expansion (79 years versus 78 years). 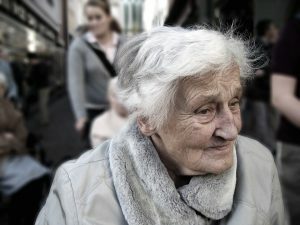 Because life expectancy reflects the cumulative effects of decades of healthcare and lifestyle habits, it is unlikely that Medicaid expansion per se resulted in a longer life expectancy but the difference in life expectancy instead reflects differences in long-standing approaches to health in different states. Smoking prevalence. Smoking rates are not much different in states that expanded Medicaid (17.3% of adults) compared to those states that did not expand Medicaid (18.0% of adults) as illustrated in a report by the United Health Foundation. 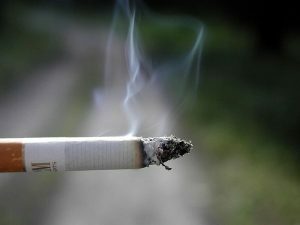 In a previous post, I noted that cigarette smoking cuts the life expectancy of men by an average of 12 years and women by an average of 11 years. Given that the smoking prevalence is reasonably similar in both groups of states, the longer life expectancy in Medicaid expansion states cannot be fully attributed to smoking, alone. It should be noted, however, that the smoking prevalence in the non-Medicaid expansion states is heavily skewed by Utah, where the smoking prevalence is only 8.8% (dramatically lower than any other state and likely due to the Mormon influence in Utah). When Utah is excluded from the analysis, the smoking prevalence in non-Medicaid expansion states is 18.5%, which is significantly higher than in Medicaid expansion states. Hospital closure. Since 2010, there have been 85 rural hospitals that have closed in the United States. Most of these closures were in those states that opted out of Medicaid expansion. 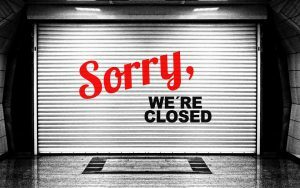 Overall, 59 rural hospitals have closed in states that did not expand Medicaid (3.5 per state) compared to 26 rural hospitals closing in Medicaid expansion states (0.8 per state). Unlike life expectancy and smoking prevalence, it is likely that hospital closures are directly related to Medicaid expansion. Rural and safety net hospitals usually serve a lower income population of patients and are more dependent on revenue from Medicaid than urban and suburban hospitals. In the past, those rural hospitals were supported by federal Disproportionate Share Hospital (DSH) funds that helped to cover the cost of caring for the uninsured and underinsured. The DSH funds are distributed based on a formula that includes the number of Medicaid patients seen at the hospital. However, the Affordable Care Act reduces DSH funds in order to offset the cost of expansion of Medicaid. Therefore, rural hospitals in states that did not expand Medicaid had less money coming in from DSH funds plus no increase in Medicaid revenues and so they found themselves going out of business. The states with the most hospital closures were Texas (14) and Tennessee (8), both states that did not expand Medicaid. Obesity. States that adopted Medicaid expansion have a lower prevalence of obesity (29.2%) than those states that did not adopt Medicaid (31.3%). Medicaid expansion has been in place for 5 years and it takes a lot longer than 5 years for the population of a state to become obese. Therefore, it is unlikely that there is a cause and effect relationship between Medicaid expansion and obesity. 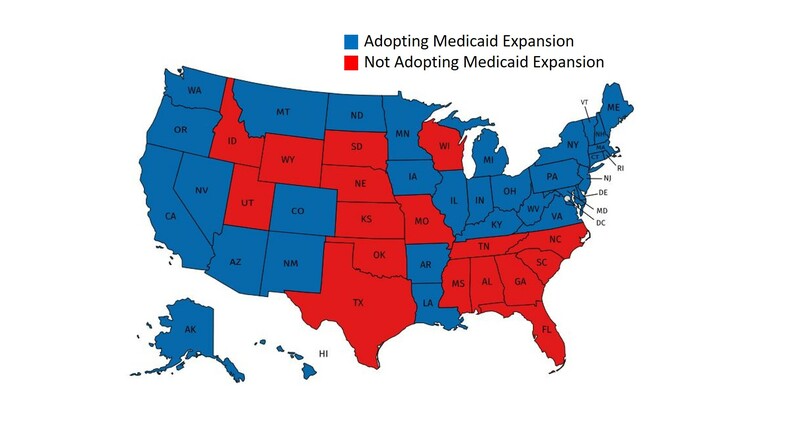 This is supported by the fact that if you examine maps of the trends of obesity in the United States over the past 20 years, the states that did not expand Medicaid had a higher prevalence of obesity before Medicaid expansion. Infant mortality. The United States has a disturbingly high overall infant mortality rate compared to the rest of the industrialized world. In fact, the only economically developed countries that have a higher infant mortality rate than the U.S. are Mexico and Turkey. 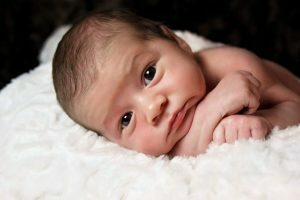 Infant mortality is a good measure of access of care to economically and demographically disadvantaged populations since mothers are young and often uninsured or underinsured. Data from the CDC indicates that in 2016, states that participate in Medicaid expansion have an infant mortality rate of 5.8/1,000 live births as compared to states that did not participate in Medicaid expansion that have an average of 6.6/1,000. Teen birth rate. This measure tends to track with the infant mortality rate. Based on 2016 data from the CDC, the teen birth rate is higher in states that did not expand Medicaid (21.2%) compared to those states that did expand Medicaid (19.0%). 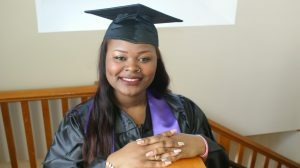 There are many risk factors for teenage pregnancy including dropping out of high school, alcohol or drug use, lack of access to birth control, and poverty. Education. Based on a report by the U.S. Census, it turns out that there is less than one percentage point difference in the percent of adults completing high school in Medicaid expansion states (88.5%) compared to states that did not expand Medicaid (87.6%). However, there is a much larger difference in the percent of adults with a college degree in states that expanded Medicaid (30.1%) compared to states that did not expand Medicaid (26.8%). This suggests that the overall educational level in Medicaid expansion states is higher than in non-Medicaid expansion states. Firearm-related deaths. States that expanded Medicaid have a lower rate of deaths due to firearms (11.9 per 100,000 population) compared to states that did not expand Medicaid (15.3 per 100,000 population). There are many risk factors for death involving firearm including the availability of firearms and the prevalence of mental health disorders. 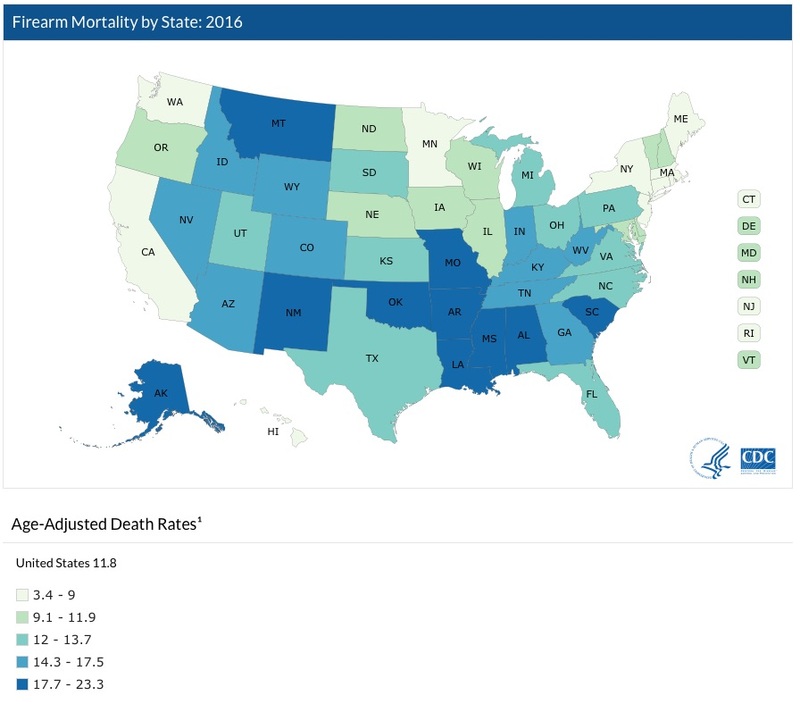 The map of firearm mortality shown here is fairly similar to a map of gun ownership per capita so it does appear that guns are more abundant in those states that did not expand Medicaid. However, it is also possible that Medicaid expansion resulted in patients with depression and suicidal ideation having more access to mental health services thus making those people less likely to kill themselves or others with guns. With the exception of rural hospital closures and possibly infant mortality, I do not believe there is a direct cause-and-effect relationship between Medicaid expansion and most of the indices of health discussed in this post. Instead, I believe that whether or not a state chose to expand Medicaid is a reflection of that state’s cultural attitude toward health. The residents of Medicaid expansion states probably had a higher valuation of health, had adopted more healthy lifestyle habits, and were more educated about health than those residents of states that elected to not expand Medicaid. There are also states that are clearly exceptions. For example, Utah (a non-Medicaid expansion state) has the lowest smoking prevalence, one of the longest life expectancies, no hospital closures, a high percentage of collage graduates, and very low rates of obesity, infant mortality, and teen pregnancy. However, because of availability of Medicaid for the disadvantaged population, for the majority of the country, differences in the adoption of Medicaid expansion has the potential to result in the healthiest states becoming more healthy, and the least healthy states become less healthy. What Is The Ideal Hospital Occupancy Rate?